Central and peripheral nervous systems are the two components of the nervous system in animals. The central nervous system comprises the brain and spinal cord. The peripheral nervous system comprises the somatic nervous system and the autonomic nervous system. The main difference between central and peripheral nervous system is that the central nervous system receives sensory information and the processed information is sent into effector organs as the response whereas the peripheral nervous system is involved in sending information to the central nervous system and sending responses from the central nervous system into the effector organs. The central nervous system (CNS) is part of a vertebrate nervous system, which coordinates the sensory impulses and their relevant responses in the body. The CNS comprises the brain and spinal cord. The CNS can be roughly divided into gray and white matter. The outer cortex of the brain consists of gray matter and the inner area consists of white matter. The gray matter is composed of neurons and the white matter is mostly composed of axons of nerves. The retina, optic nerve, olfactory epithelium, and olfactory nerves also belong to the central nervous system. The brain consists of 100 billion nerve cells, which are protected by the skull and protective membranes called meninges. The support cells to the brain neurons are called glial cells or neuroglia. Astrocytes, oligodendrocytes, ependymal cells, and radial glia are found in the CNS as glial cells. The brain can be divided into four lobes: frontal, occipital, parietal, and temporal. The frontal lobes are responsible for the voluntary movements of the body. The occipital lobes receive visual impulses from the eye. The parietal lobes receive sensory information such as temperature, touch, taste, and pain. The temporal lobes are responsible for the memory and hearing. The brain initiates the voluntary movements of the body. The spinal cord is protected by the vertebral column, which starts at the base of the brain. The main function of the spinal cord is to communicate with the brain and peripheral nerves. The spinal cord is composed of eight cervical segments, twelve thoracic segments, five lumbar segments, five sacral segment, and one coccygeal segment in humans. The peripheral nervous system (PNS) is the other part of the nervous system in vertebrates, which send sensory signals to the CNS and response of the body to the effector organs. The PNS is composed of neurons and neuron clusters called ganglia. The PNS can be divided into two as somatic nervous system and autonomic nervous system. The somatic nervous system (SONS) controls actions of the body via voluntary movements and reflexes. The afferent fibers of the PNS carry sensory signals from the external stimuli. The sensory organs, which are connected by the afferent nerve fibers are eye, nose, tongue, ear, and skin. The efferent nerve fibers carry instructions from the CNS to the effector organs. The reflexes have no integration with the CNS for the response. The monosynaptic reflexes contain a single synapse between sensory and motor neuron and polysynaptic reflexes contain as least a single interneuron between the sensory and motor neurons. 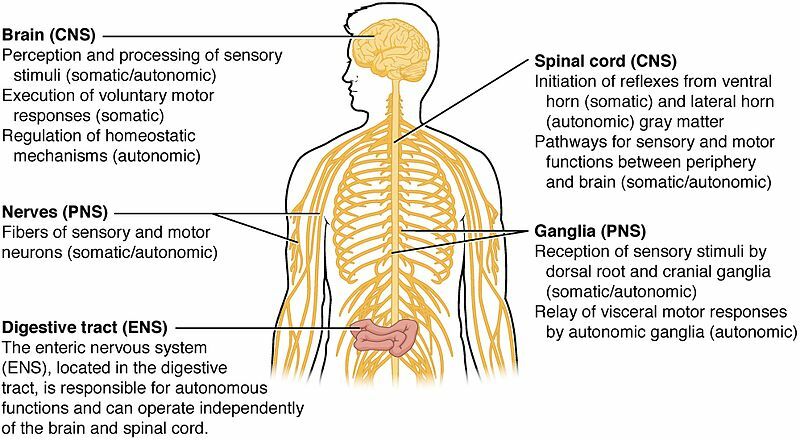 The autonomic nervous system (ANS) controls the unconscious or involuntary muscular movements. The ANS controls the functioning of the internal organs, breathing, heartbeat, and digestion. The two complementary parts of the ANS are sympathetic and parasympathetic nervous systems. The sympathetic nervous system prepares the body for fight-or-flight response under stressful conditions by raising the heartbeat, blood pressure, and dilating the pupil. The parasympathetic nervous system keeps the body at rest. The secretion and digestion are stimulated by the parasympathetic nervous system. The third component of the ANS is the enteric nervous system, which is capable of directly controlling the digestive system of the body. The nervous system of the body in humans is shown in figure 2. Both central and peripheral nervous systems are the two components of the nervous system of vertebrates. Both nervous systems are involved in responding different environmental stimuli in the environment, maintaining the life. Both nervous systems comprise neurons with the same physiology. Central Nervous System: The central nervous system is the part of the nervous system in vertebrates, which comprises the brain and spinal cord, to which the sensory impulses are carried out and processed in order to coordinate functions in the body by sending the motor impulses to the effector organs. Peripheral Nervous System: The peripheral nervous system is the part of the nervous system in vertebrates, which comprises the somatic and autonomic nervous systems. Central Nervous System: The central nervous system consists of the brain and spinal cord. Peripheral Nervous System: The peripheral nervous system consists of sensory receptors, sensory neurons, and motor neurons. Central Nervous System: The nerve axons of the central nervous system consist of slender projections and carry significantly short nerve impulses. Peripheral Nervous System: The peripheral nervous system is composed of long nerve fibers with a length up to 1m. Central Nervous System: The major function of the central nervous system is to organize and analyze the information obtained from sensory organs. Peripheral Nervous System: The major function of the peripheral nervous system is to transmit sensory information to the central nervous system and pass out motor impulses to the effector organs. Central Nervous System: A damage in the central nervous system causes a global effect on the body. Peripheral Nervous System: A damage to the peripheral nervous system causes a local effect on the body. Central Nervous System: Most of the nerves in the central nervous system are incapable of regenerating its nerve fibers. Peripheral Nervous System: Most of the nerves in the peripheral nervous system can be regenerated. Central and peripheral nervous systems collectively make up the nervous system in vertebrates. The CNS comprises the brain and spinal cord. The PNS comprises somatic and autonomic nervous systems. The PNS is involved in the transmission of sensory impulses from its sensory receptors into the CNS. The receiving nerve impulses are processed in the brain and the relevant responses are sent to the effector organs through the PNS. The major function of the CNS is to coordinate the sensory impulses obtained from both external and internal environment of the body. 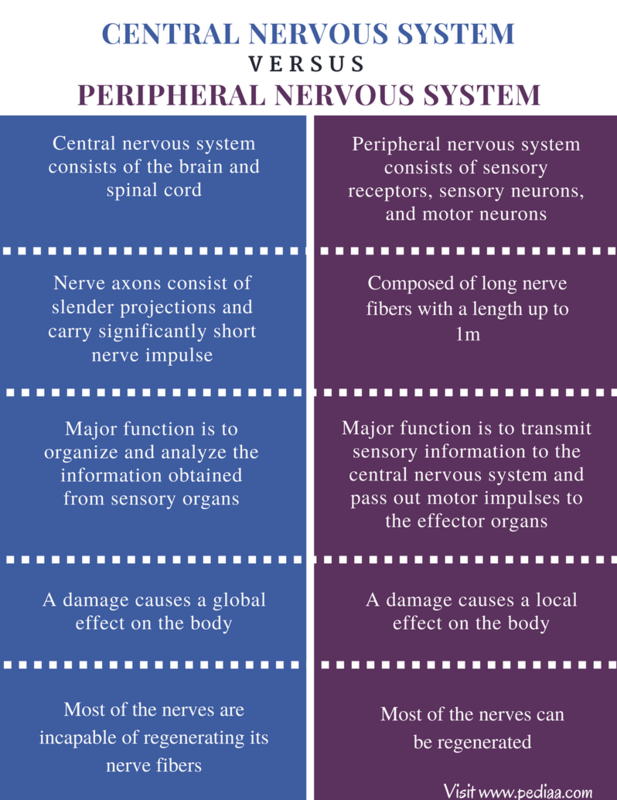 Therefore, the main difference between central and peripheral nervous system is their role in coordinating the functions of the body. 1. Newman, Tim. “Central Nervous System: Structure, Functions and Diseases.” Medical News Today. MediLexicon International, 02 Mar. 2016. Web. Available here. 03 July 2017. 2. “Central Nervous System (CNS) Function, Parts, Diagram & Charts.” EMedicineHealth. N.p., n.d. Web. Available here. 03 July 2017. 3. “The Peripheral Nervous System (PNS) – Boundless Open Textbook.” Boundless. N.p., 08 Aug. 2016. Web. Available here. 03 July 2017.